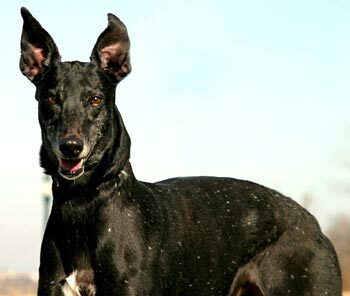 Madge, aka Dary's Lady, is a stunning, 9-year-old, Irish black female with tiny white ticking born August 12, 2001. 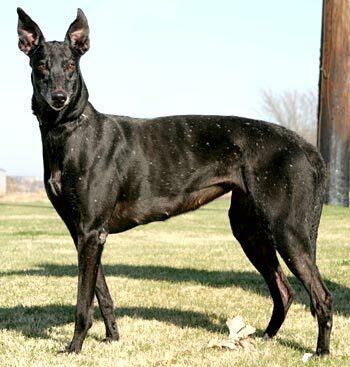 Her sire is Irish-bred Droopy's Merson, and her dam is Irish-bred Kylies Sonia. Madge's racing career was all in England, beginning December 11, 2002, and continuing until February 21, 2004. 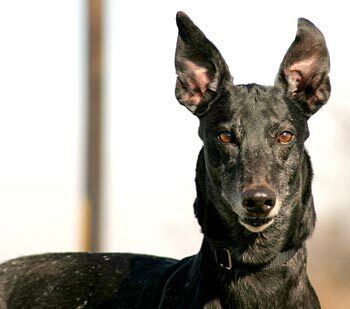 Madge was part of a total of 7 greyhounds received when a south Texas farm closed. She joins GALT's O'Greys - ChaCha, Foxie and Patty, as well are senior girls JoJo, Nice Girl and GoGo. Madge is not cat tolerant, but she gets along fine with small dogs. Madge is a joy to live with and love. She minds better than my dogs and is very well "house broken." She doesn't jump on people and she is fine with the small dogs. She normally sleeps on her dog bed or the cool floor, which was a surprise to me. She occasionally gets on the bed, but normally will not. I feed her in her crate and she can stay in her crate if I need her to for any reason. Otherwise she is left loose in my bedroom while I'm at work or gone. She is playful and loves to run around in the yard chasing and being chased by the other dogs. She thought running in the snow was great fun. You would NEVER know she is a Senior. Her black coloring with the white "salting" over her back makes her very special. She is a major tail wagger and it goes nonstop. I can't say enough good things about this little girl. She will make someone a very special addition to their family.